Hugo is getting ready before he sets out to practise his water ballet routine at the local swimming pool. Bella, annoyingly, is copying everything he does. She even picks out the same outfit as Hugo ...hat, goggles, water wings, flippers and gingham costume. Hrmph! Bella continues to copy Hugo once they're in the water, adding to his infuriation. But then a poolside bird and hippo rush to take a photo of Hugo and Bella's fabulous routine, swimming in perfect harmony. And the copying that caused all the friction is now something to be proud of! Hugo and Bella head straight for the ice-cream parlour to celebrate but will they choose the same flavour or will they both want something different? 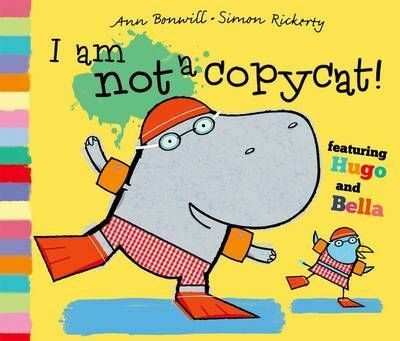 With wonderfully quirky illustrations from new talent Simon Rickerty and a great read-aloud text, this is a made-for-sharing picture book.